Learn how to read and display images in Matlab. Learn RGB and YcrCb color spaces. Learn subsampling, upsampling, interpolation, replication methods and MSE computation in Matlab. Our first task was to read the jpeg image into Matlab. Matlab represents an image as an array of pixels where each pixel represents an R, G or B value. Therefore we get a wh3 array (where w is the width of the image and h is the height), or a 3D array. To display each color band, we simply replace the other band values with zeros (Figure 1). 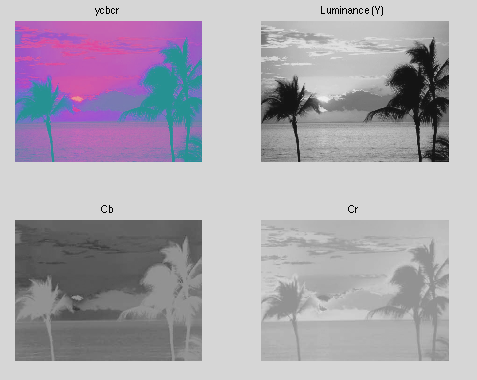 We then explore the YCbCr color space which can be used w/ the rgb2ycbcr command (Figure 2). This will give us three different bands: Y, Cb and Cr which operate in a way similar to the RGB color space but exploit information about human vision to reduce redundancy. We then move to the part of the lab where we experiment with sampling. First, we sub-sample the chroma bands of the YCbCr image. We use a ratio of 4:2:0 which removes every other row and column from the Cb and Cr pixels. We then use two different upsampling schemes to restore the image. The first technique, replacement, simply takes an adjacent color and copies it in place of the pixel removed in the sub-sampling step. This is a simple technique, so it can be improved upon by using the second technique: linear interpolation. 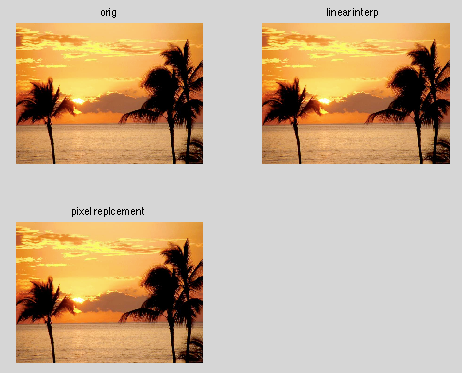 Using linear interpolation, we take the average of the adjacent pixels and replace the missing pixel with that value. When we compare the two upsampled images with the original, it is clear that linear interpolation provides smoother color gradients in the reconstruction. We then perform some analysis on the reconstructed images. It should be noted that the Cr and Cb bands upsampled images have half as much pixel information than the original, however, they are still almost indistinguishable (Figure 5). This is because the implementation of the YCbCr color space exploits the weaknesses in human vision. Human vision is most sensitive to changes in intensity, not color which RGB is based on. So, even though 4:2:0 means 1/2 resolution in both horizontal and vertical directions, the difference is imperceptible even on the naive upscaling method of simple color replacement. Figure 5: The difference between the interpolation methods is almost imperceptible. or a 1:2 compression ratio, a modest compression and essentially no quality loss. It is clear from this presentation that by use of naive compression methods such as interpolated upsampling we can achieve a reasonable degree of data compression with minimal quality loss. Given, this fact it would be prudent to explore more aggressive lossy compression methods in which a higher degree of compression is achieved for a higher loss of quality.